On Funbridge, the “Challenges” game mode is one of the most popular among our community of players. It consists of challenging another player one-on-one in a tournament of 5 deals (the same for both players). The objective is to score better in the whole tournament to win the challenge! You can also challenge the Funbridge artificial intelligence called Argine (Find out more about Argine). That’s what Milan Macura, a professional bridge player who became Junior World Champion in 2009, does every week. He makes videos so that you can see how he plays and learn from that. His videos allow you to see how you compare to him but it is above all an excellent way to progress. Milan vs Argine, it’s now, enjoy watching! 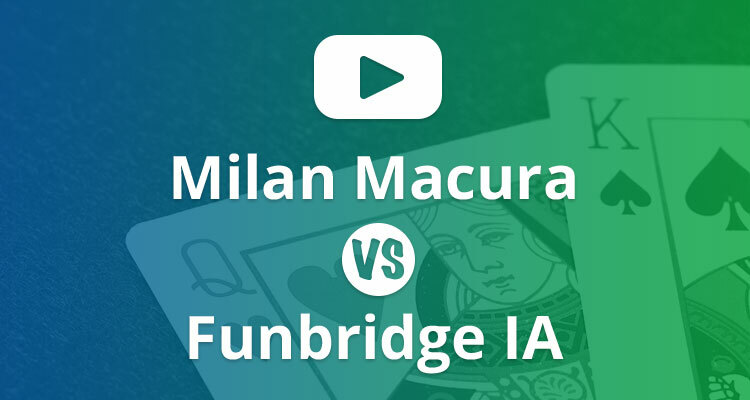 Here is the new video of the series of bridge challenges between Milan Macura and Funbridge articial intelligence, Argine. Go find out who will win this new match in the video below! If you have missed the previous episodes, click here to access the “Videos” section of our blog.